Alistair Wye is the global legal A.I. subject matter expert at iManage and the Head of Presales at RAVN Systems, which was acquired by iManage in 2017. Prior to joining RAVN, Alistair worked as a banking lawyer specialising in leveraged finance. What kickstarted your interest in coding? It all began with a beer! A computer scientist friend at university and I were talking about junior lawyers. I explained trainees and juniors work gruelling hours doing robotic tasks. One in particular stood out: the repetitive proof-reading of long documents to confirm capitalised terms are defined, defined terms are capitalised, and clause cross-referencing is correct! As anyone with a coding background would be, my friend Tom was aghast. He couldn’t believe nobody was automating these tasks, reducing them from hours to seconds. Tom explained how to code a plugin for Microsoft Word to solve this problem. Still working as a lawyer, my progress was slow. Working crazy unpredictable hours week in week out and most weekends meant what little free time I had was often spent catching up on sleep. However, I kept at it, eventually deciding to take a sabbatical from the law in 2016 and pursue an intensive coding bootcamp at Makers Academy in London. During that 16 weeks I built lots of apps and learnt a wealth of best practices and cemented a lot of knowledge. Sadly I never built that Word plugin – someone else did and sold it for a decent price! A chance encounter with RAVN many months after returning to law led me into my current role. As Steve Jobs said, “you can’t connect the dots looking forward; you can only connect them looking backwards”! 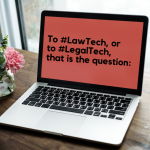 At the time I had no idea I’d end up in legaltech, but by learning to code I did. Lawyers are trained to identify problems, break them down and divide and conquer them through clever drafting and / or advice. Coding shares, and reinforces these disciplines. Two years and counting. My only regret is not starting sooner – there’s so much to learn. However, in the last 5 years or so the quality and quantity of free / cheap online resources has exploded. EdX, Coursera, Udemy, Codecademy, freecodecamp.com all provide excellent platforms from which to learn coding, coding paradigms, computer science and even A.I. techniques such as machine and deep learning. The blogging platform Medium has fantastic snappy up to the minute content produced by techies, often with great mini projects like building a simple blockchain or neural net! I’ve got plenty to keep me busy for many years to come. Absolutely. As a lawyer, particularly one interested in tech, learning to code can help you bridge an important, but under-served, gap. That gap is the gulf between technologists and business users. Being able to translate between the two makes you valuable, whether at a law firm, a commercial business or a tech company. Since 2016 or so there’s been rapid growth in legaltech A.I. and automation start-ups, the Legal Geek community and emerging career paths such as A&O’s recently announced alternative training contract for STEM grads. Together these demonstrate how valuable coding, or at least a deep understanding of tech, can be to those working in and around the law. My current career path is an example. Demonstrable coding experience plus a legal / financial background turned a chance conversation with a start-up into a role I never knew existed. As a result of learning to code I found an exciting way to move sideways from law into a commercial role at an A.I. start-up. In my role, my value is being a translator between two tribes: lawyers and business users on the one hand; technologists and data scientists on the other. Having been at the coal face doing laborious legal tasks at 4am for the umpteenth week or month in a row, I am acutely aware of the pain points for business users, but also how we might solve them creatively with tech. Unless you’ve been there, it’s hard to “get it” in terms of identifying and understanding the problem, and without knowing how to code I’d probably misjudge what’s technologically solvable from what’s not. Good legal drafting and clean code have lots in common. Code is clean when it’s understood easily by everyone, extensible and maintainable, not just today but also tomorrow. Good drafting is much the same: contracts need to be clear, concise and unambiguous. Key concepts between the two disciplines also overlap. For instance, in coding variables point to a stored value and can be referenced and manipulated by other code. Similarly, defined terms in contracts are a labelled value that is similarly referenced and in some cases updated or reset by the operative provisions of a contract. Coding often involves a lot of research (e.g. via Stackoverflow, Github etc) and reliance on frameworks or libraries of code produced or maintained by colleagues or the community. Likewise, lawyers research legal issues (e.g. via WestLaw, Lexis, PLC etc) and rely on precedents or template documentation produced by colleagues or third parties to deliver their work. Problem solving is a key legal skill, and one key to coding. Being able to identify and breakdown an issue into smaller parts to research and experiment to the solution is something coders and lawyers have in common. The main difference between coding and law is ambiguity. Code is unambiguous whereas law is not. I think this is the biggest challenge for figuring out how to combine technologies like smart contracts with legal contracts (as the two are often confused, but entirely different) in such a way that contracts live and breathe from cradle to grave digitally rather than in words. In doing so they may evolve into something else entirely, albeit perhaps for narrowly defined applications than contracts in general. I’m genuinely fascinated by the intersection of law and coding and have event started writing about this topic on my blog, www.lawtomated.com! Do both at once! If you’re a practising lawyer, especially a transactional one, it’s hard to make time. In terms of careers, I think it’s easier for lawyers to learn to code than for coders to learn the law. Why? The answer is legal education unfortunately remains expensive, long and rather closed with little quantity or quality material online for free. Added to that, a lot of legal training is rather academic: a law degree does not make a lawyer. What makes a lawyer is working with the law, whether that’s solving legal problems with research and advice or drafting, reviewing and negotiating legal documents. Although you don’t have to be a qualified lawyer or paralegal to do this, it’s much easier if you are. Coding is the opposite: you’re spoilt for choice online in terms of quality resources, and coding is by its nature very practical. There’s even websites and blogs that have tried to recreate the contents of top CS degrees using free or affordable online resources, and many tutorials on how to build clones of popular apps like Uber, Instagram etc. No such luck with law sadly.